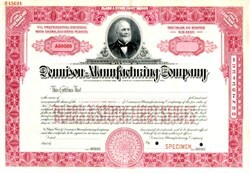 Beautifully engraved RARE specimen certificate from the Dennison Manufacturing Company printed in 1927. This historic document was printed by the American Banknote Company and has an ornate border around it with a vignette of Eliphalet Whorf Dennison. Avery International Corporation became Avery Dennison after the company merged with the Dennison Manufacturing Company in 1990.